Cosmologists have long struggled with facts they can’t explain. In the 1920s, they discovered the universe has been expanding since the Big Bang, the enormous explosion that gave birth to the cosmos about 13 billion years ago. But since the 1930s, they’ve known that visible matter doesn’t have enough gravitational pull to hold the galaxies together. So the universe must also contain some invisible stuff, dubbed dark matter. In the late 1990s, they discovered that the galaxies are not coasting under momentum from the Big Bang. Defying the laws of motion and gravity, the galaxies actually are moving faster. The cause of this acceleration, now called dark energy, is considered the greatest mystery of cosmology. Some would like to revive Albert Einstein’s famous cosmological constant. Einstein introduced the constant into his equation for general relativity to match the prevailing concept of the time: a static universe. He retracted the constant after the discovery that the universe is expanding. The universe now seems to need the cosmological constant, or something like it, to explain its accelerating expansion. Besides the cosmological constant, scientists have imagined a variety of forces that might have been suppressed early on and unleashed later to speed the galaxies. “The origin of this dark energy is unknown, and in fact it could be that the accelerated expansion is actually due to a modification of Einstein’s theory of gravity on very large scales instead,” says Katrin Heitmann, a physicist and computational scientist at Argonne National Laboratory (ANL). Heitmann is principal investigator of the ANL part of Computation-Driven Discovery for the Dark Universe, supported by DOE’s SciDAC program (for Scientific Discovery through Advanced Computing). Under the direction of Argonne’s Salman Habib, the multi-laboratory project is developing the computational and statistical tools supercomputers can use to help solve the dark-energy mystery. SciDAC is part of the Advanced Scientific Computing Research program in DOE’s Office of Science. The project dovetails with the work of cosmologists who study dark energy. The earliest data come from the oldest light in the universe, the Cosmic Microwave Background (CMB). Filtering to Earth between the stars and galaxies, this energy is left over from the universe’s infancy, some 380,000 years after the Big Bang. Tiny temperature differences throughout the CMB reveal random disturbances – sound waves – that reverberated through the early cosmos. In short, the CMB depicts the initial conditions for the structures of matter today – stars, galaxies, galaxy clusters and the much more massive dark matter halos and filaments that make up the cosmic web. Scientists have been using specialized telescopes to amass data about the CMB and the universe’s visible matter in search of clues to dark matter and dark energy. They’re planning still more data-gathering projects. Two projects will create the most detailed maps to date showing the positions of galaxies and gas clouds. The first, in progress, is the Baryon Oscillation Spectroscopic Survey (BOSS). It’s the latest stage of the Sloan Digital Sky Survey (SDSS), a collaboration of 27 universities and other research institutions. Baryons comprise ordinary, visible matter; oscillation refers to the ancient sound waves the CMB revealed; and spectroscopy is the detailed study of light. The project is creating a large-scale map of galaxy distribution. The next SDSS stage, the Mid-Scale Dark Energy Spectroscopic Instrument (MS-DESI), is set to begin in 2018. 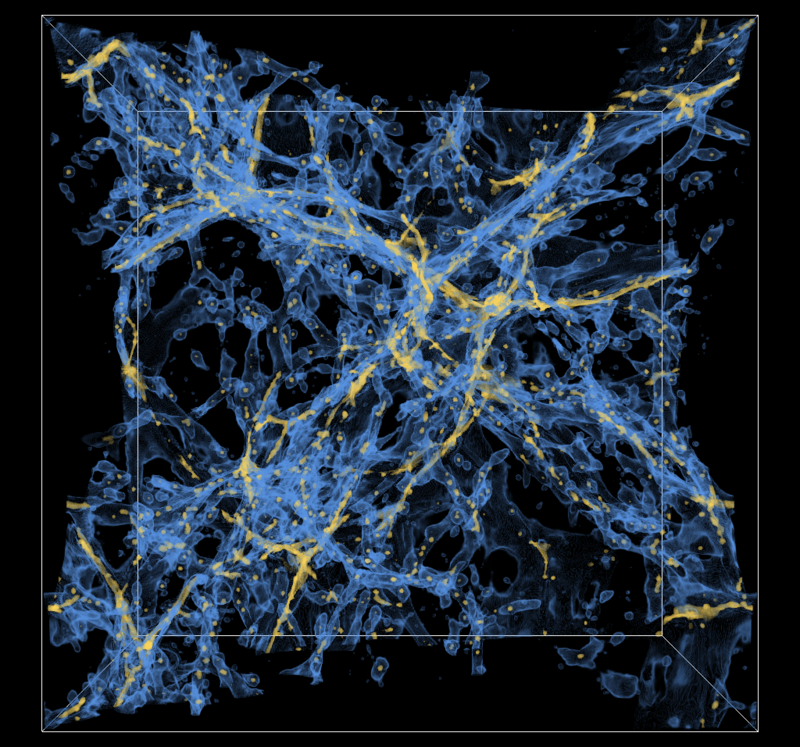 Run by DOE’s Lawrence Berkeley National Laboratory, MS-DESI will create the largest three-dimensional map of the universe. To expose the invisible hand of dark matter in the BOSS and MS-DESI maps, computational scientists will simulate the birth and growth of the universe tens of thousands of times, portraying the influence of different possible dark-energy concepts. The calculations will give cosmologists ideas on where to seek clues in astronomical surveys.